For over two years now I’ve been nudging Hisin, my kids nanny to give me the famous recipe for her zaa’tar bread rolls. Two years back, she came over one morning with a bag of five freshly baked warm, fresh rolls. With one bite I was hooked, not only from their aromatic aroma and soft texture, but also from the little piece of feta cheese that was nestled inside. I finished all five that morning, and the next day Hisin arrived with an even bigger bag and said blankly, “one day I’ll teach you how to make them”. It’s been just about a year since Hisin doesn’t come over on a daily basis, with the kids all in preschool, but we keep in touch and see each other around the neighborhood every so often. A few months ago I remembered those rolls, and how she told me she would give me the recipe, and so I started nudging her again. And how much water I asked? And she replied, “Just until it becomes dough”. ah huh, sure. So with that recipe in hand I tried to make them none less than five times. And every time I got a bit closer to the original. On one of my attempts I used 70% whole wheat flour, and on another buckwheat flour, both which worked great. The making of the dough for this recipe is quite simple, but making the balls is the only thing that is a bit time consuming. I asked my kids to help me make them, and they stepped up gladly to the challenge. 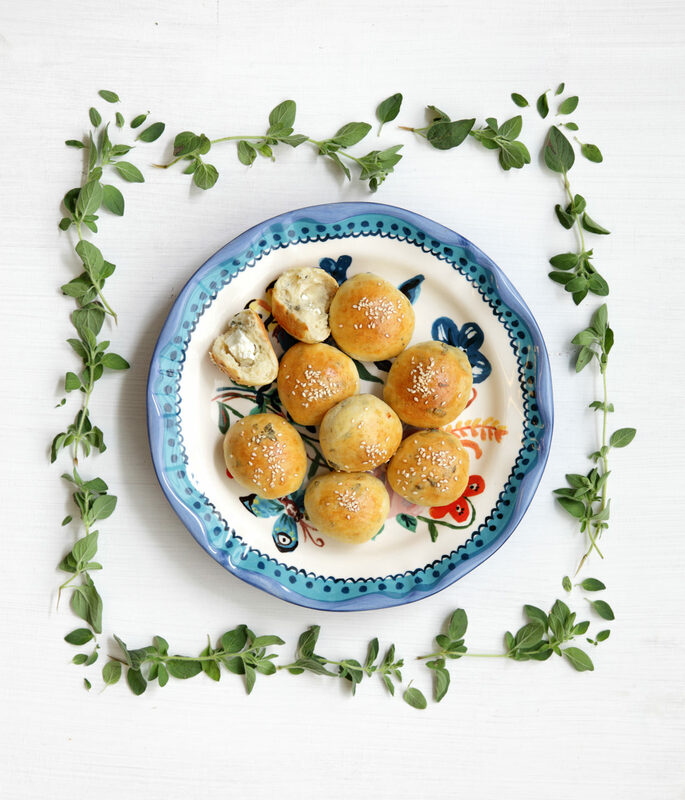 This recipe makes about 80 little rolls- I know it sounds like a lot, but I like to make the dough and then freeze half of it (freezing it only after it rises). If I’m already making the dough I find that it’s really nice to have ready-made dough in the freezer that can be baking within just one hour (a great thing to have on hand when you have guests over). Hisin’s recipe calls for 5 tablespoons of milk powder which make the dough really soft. But after Deanna told me about all of the preservatives in milk powder we decided that we’d take the dough without the added softness. 1. In a large bowl mix together the flour and yeast. Add the sugar, salt, and zaatar and mix until combined. 2. Add the water and oils and with your hands, bring the ingredients together until sticky dough is formed. 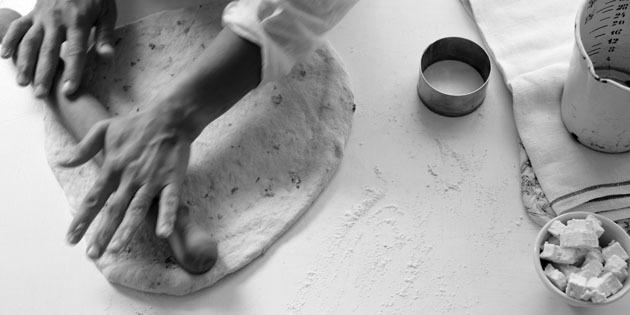 Pour dough out onto a lightly floured surface and knead the dough for about five minutes. 3. Place the dough into a large bowl, cover with plastic wrap and allow the dough to rise in a warm area until doubled in size (which should take about an hour). 4. 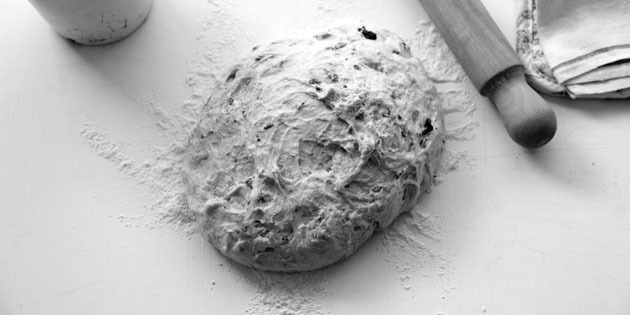 Once dough has risen, divide the dough into two equal pieces and cover one of the pieces with plastic wrap and freeze. Divide the remaining piece into another two equal pieces. 5. 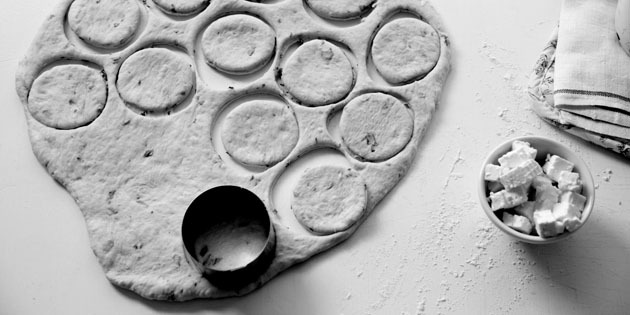 Working on a lightly floured surface, roll the dough out to 1 cm/1/8 in. and use a round cutter (or a wine glass) to cut out 7cm./2.5in. circles. 6. 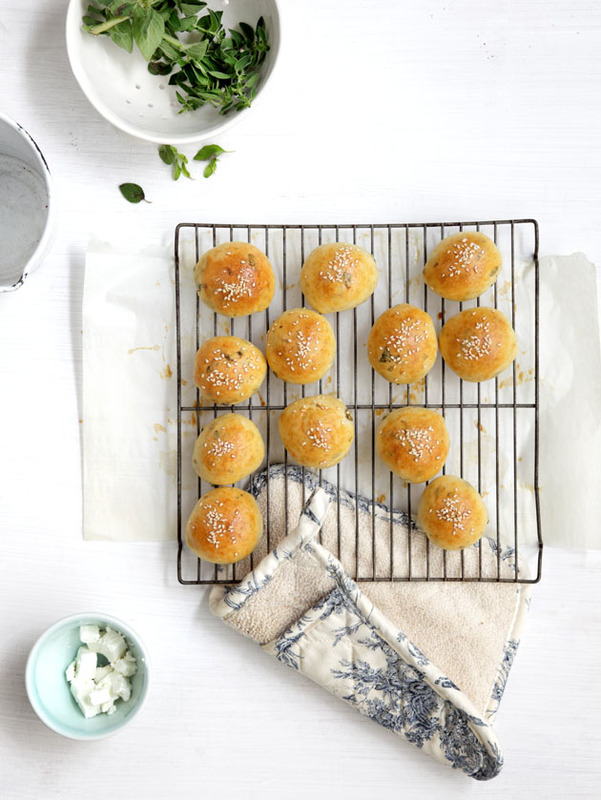 Place a small cube into the middle of each circle and close each into a ball, tucking the dough on the bottom of each ball. 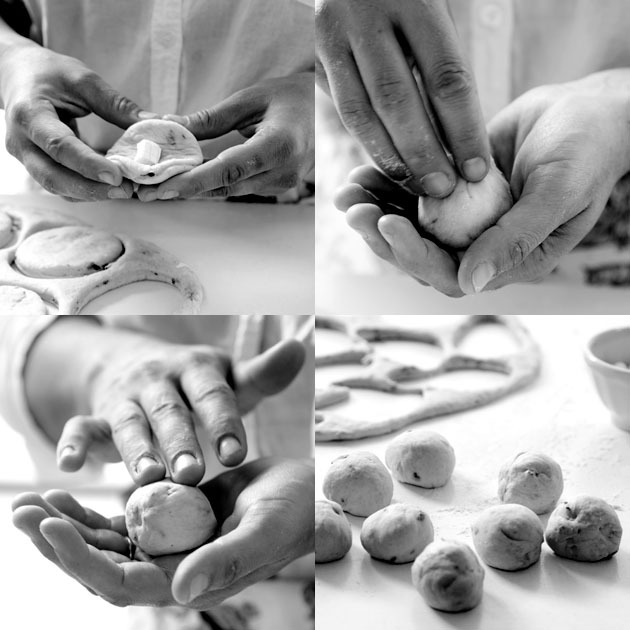 Roll each ball of dough in between the palms to shape. 7. Place the balls onto a baking tray lined with parchment paper, cover with a clean kitchen fowl and allow to rise for an additional 20-30 minutes. Meanwhile, preheat oven to 350F./180C. 9 . Allow to cool on a cooling rack for 10 minutes before serving.